Saturday & Sunday March 30-31, 10:00am-5:00pm | Cost $175.00 REGISTRATION CLOSING SOON!!! We welcome you to a full weekend of flame effects knowledge, applications, design and “hands on” experience to inspire you and make your projects come to life with fire! Leading this weekend will be Dave X, Fire Safety Manager for Burning Man for more than 10 years, and Eric Smith, Director of Education and Code Development for the State of Nevada Board for the Regulation of LP Gas and owner of www.poofersupply.com. The workshop is intended for those wishing to incorporate flame effects into their projects. 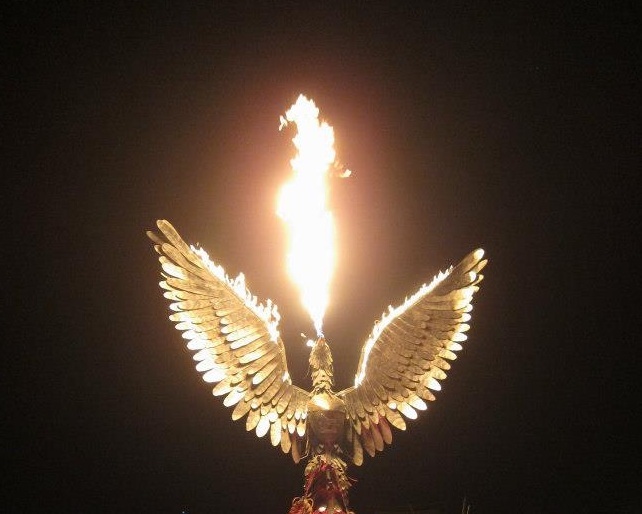 It is open to beginners, and those experienced with flame effects, wishing to take their work to a new level. Participants will learn how to comply with National Fire Protection Association (NFPA) standards, hear from the pros working with flame effects and have fun while learning safe practices. The Sacramento Regional Contacts are teaming with Kindergarten Kamp, a Burning Man theme camp (8 years on playa), to host the workshop. Leading the effort together are Norm Tucker and Kathleen Hoffman (Sacramento RC) as founders of Kindergarten Kamp and part of the team that brought “The Phoenix Risen” to the burn in 2012. This two day workshop will feature NFPA codes, basic practices, design and a “hands on” practicum for those incorporating fuel based flame effects into your art. Codes - NFPA 58 (Liquefied Petroleum Gas Code), NFPA 160 (Standard for the Use of Flame Effects Before an Audience), and other codes. The physical properties of LP gasses to include a close examination of LP gas within a clear propane cylinder. “Hands on” with flame effect parts and fittings. Designs for flame effects including accumulators, free burning effects, fuel mortars, pilot lights, hot surface igniters and more. Demonstrations and “hands on” materials will be explored. Putting what we have learned into action to create a “one of a kind” flame effect art project from materials on hand. Participants working together to assemble and build a project to completion! At the end of class on Saturday, we are planning a social/mixer for all to gather and enjoy good company!